I have been studying yoga with Lillah Schwartz in Asheville since the fall of 2011. Through Lillah, I completed my sixth 200-hour yoga teacher training as well as my 500-hour teacher training, and now I am working on my yoga therapy certification. It’s part of what I do not only to become a better teacher after 17 years of teaching, but also a study that has been deeply rewarding to me on all levels. Each weekend with Lillah starts pretty much the same. Yoga. Then more yoga. Then, when you are practically lying on the floor from exhaustion, some more yoga. You could spend $1,000 getting Rolfed to get the stress out of your body or you could do a weekend of solid yoga. Sunday mornings, just when you think you have had quite enough, we come early to the studio to practice 30, 45 or 60 minutes of breathing exercises, called pranayama. This is a particularly delicious practice because when your muscles are tired from two days of asanas, your mind can achieve this very deep meditative state. One of my favorite pranayama techniques is Bhramari (pronounced BRUM – er-ee) Pranayama – also known as Bumblebee Breath. Sit or lie in a comfortable position. Close your eyelids. Press your thumbs gently into the flaps of each ear. Bow your head to activate chin lock, or jatharlahanda banda. On your exhale, squeeze your lower abdomen and make a sound like a bee, bringing the energy into your head. The first couple of times you try Bumblee Breath, you may feel like I did – like giggling madly, as it will seem quite silly at first! As you go along, you may notice the energy calming your mind while at the same time bringing a quiet fullness to your brain. 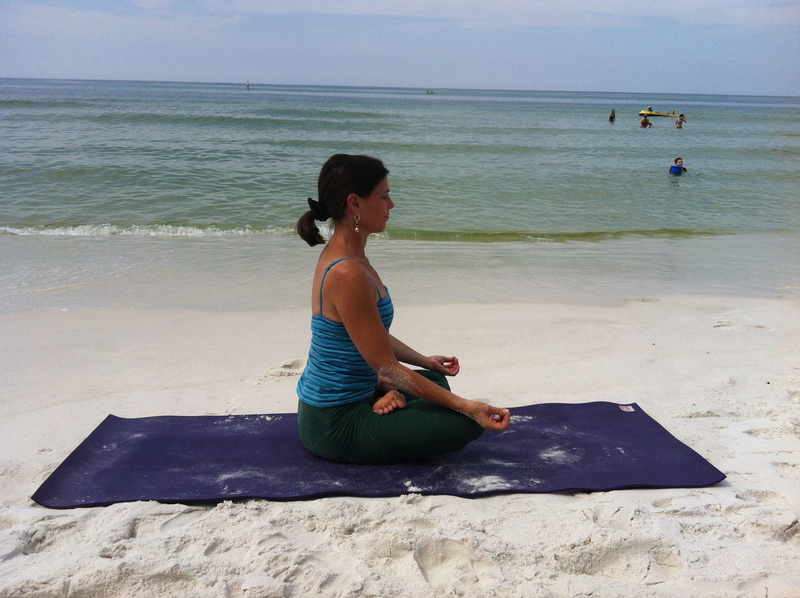 One morning at a recent yoga retreat with Lillah, we practiced about an hour of pranayama. After breakfast, we were practicing forearm stand in the middle of the floor. Through my own error, the woman I was spotting to kick up into forearm stand accidentally whacked me in the right eye socket. I fell back onto the floor immediately, clutching my eye silently. But I tuned in and I felt the benefits of our previous pranayama practice continuing, as my head was literally full of chi. I knew then and there that I was going to be fine. I had no bruises – just felt a little shocked and embarrassed. Bumblee Breath is a natural healing remedy for anxiety. It also stimulates the pineal and pituitary glands in the brain, releasing tryptophan and serotonin, which make you happy. This technique is helpful not only for relieving anxiety but also for easing depression, insomnia and restlessness. Scientists have discovered a mysterious humming at the center of the Milky Way galaxy. Bumblee Breath is believed to mirror this sound, making us feel not only calm but deeply connected to all that is. When you begin to practice Bhramari, start with 3 to 5 repetitions and move up to no more than 17 times per sitting. Follow with lying or sitting meditation. Catherine, there is a typo on the istructions part 5. – the last word. Bring the energy into your (head/hands?) I think head but wanted to let you know.